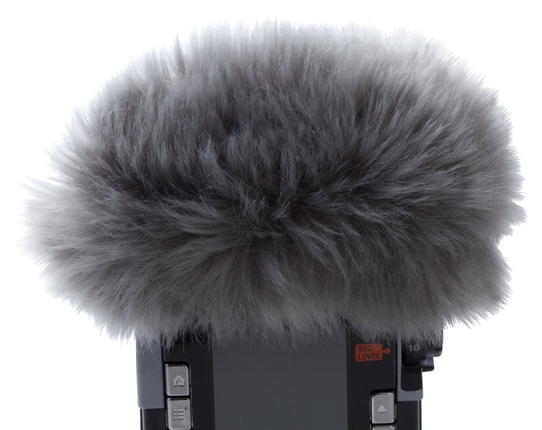 One of the most annoying aspects of digital recording, especially when recording outside and collecting nature sounds, interviews or even recording music, is wind noise across the microphones. The latest digital voice and music recorders from Olympus come complete with some amazing microphones built-in to pick up every sound. But sometimes, every sound can be a tad annoying. The Olympus LS series digital recorders are specifically designed for music recording, being able to cope with wide ranges of audio volume and pitch, from quiet to booming audio. As a consequence they are also fantastic for interview recording and for recording nature sounds like bird song and frog calls. Being out and about you need a way to reduce the wind noise over the microphones. Olympus have this covered with the Olympus WJ4 a.k.a. windjammer. Not only does it look the part but it also performs the part. One of the first WJ4’s we sold was to a Formula One journalist. His feedback after the first race of the season was “fantastic”. Not only did it reduce the background noise of the pits but with its unique furry appearance gained the attention of the drivers and hence some key interviews. The nature recording community are also embracing the WJ4. Allowing the crystal clear recording of bird and frog sound in the ultra high PCM recording audio format, uncompressed wav. So if you are looking for a way to reduce the noise and the wind with your LS series digital voice and music recorder look no further than the WJ4 windjammer. The Olympus WJ4 is compatible with the LS-100, LS-12 and LS-14 digital recorders.